Lentils are the easiest thing to make which is why when I don't feel like cooking or don't know what to make I make this. 1. Boil water in a small pan, add in salt, chilli powder and chilli to taste. 2. Once boiled for each person put in one handful of lentils and leave on a low heat. 3. When the lentils have softened turn up the heat to reduce water. 4. Add in coriander whilst its still cooking, if you like raw coriander then add at the end. 5. In a frying pan add a some butter or a bit of oil and crushed garlic. 6. Pour the oil into the lentils when the garlic is a light golden brown colour. 7. Then its ready to eat. 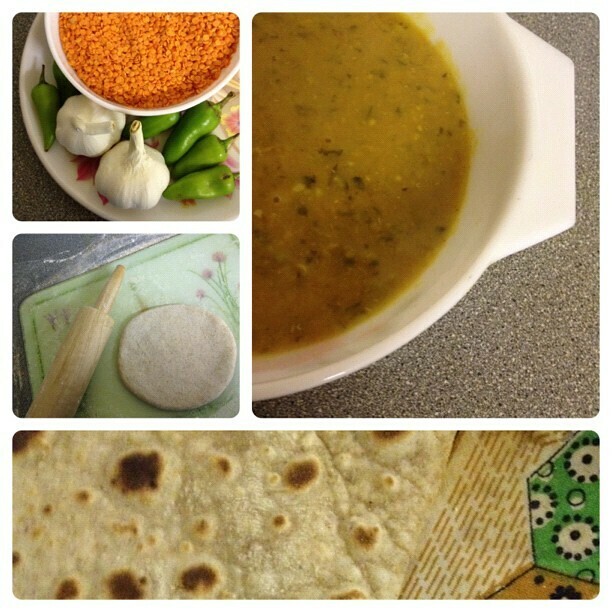 It tastes great with warm french bread, parathas or corn bread. I use medium brown flour as white hardens the chapatti and brown reminds me of Branflakes. So you may want to buy a pack of brown and white flour and mix the 2 together. Make your dough using water. Some people say that roughly mix the flour and water, then leave it to rest for half an hour and go back to it to kneed it, apparently it makes the best chapattis. My mum has bought a dough mixer so I just make it before I'm going to make my chapattis. Also some people do like to put salt in their mixture too but I never have which I'm glad about as its so easy to put too much in. Once the doughs ready just roll it out and place in a pan, turning over when needed and at the end heat on an open flame, tossing it over so it doesn't burn, a second on each side. Watch it puff up! If you don't feel comfortable doing that, then you can just get a tea towel and press both sides on the pan, turning it over. Since I mentioned in my weekly photos last week that I'll take more photos of my evening meals, I decided I might as well share the recipes too. The photos aren't brilliant though as its just hard to make it look delicious but I assure you it is. If there is a meal you'd like me to repost on this blog let me know and I'll try and do it.